RUSH: How you doing, Richie? RUSH: UPS driver just walked in. He always brings the Apple stuff. You want me to sign this? RICHIE: Nice to finally meet you. RUSH: Just remember I got a live mic here, so no cursing. 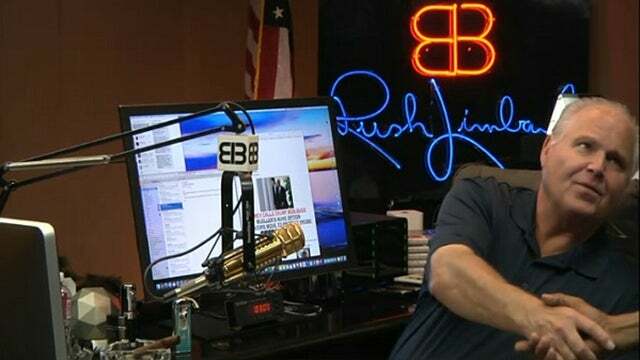 (Richie laughs) Twenty-two million people are listening right now. Just Richie? RUSH: All righty. Hang on, folks, I’ll be right back. I just do this about a million times a week. I-E or Y on Richie? RUSH: I gotta run here so there’s no dead air. That would be very bad. There you go, Richie, and thanks for always bringing the stuff. You’re like Santa Claus every day you show up. RUSH: You bet. All right. RUSH: No, no, no. FedEx brings stuff here too. UPS usually brings the Amazon stuff. FedEx brings the cigars and Apple, but sometimes UPS gets the Apple stuff depending on if it comes from China. But we have a great relationship with both. They’re crucially important. And if somebody says they’re gonna send something by 10:30 on a particular day, it better be here, or we start asking why. And in the process we’ve developed relationships with all these people. So I said, “Richie, come back!” He was driving his truck, come back. He was listening, but he couldn’t come back ’cause he was on the way to another delivery. So he had another delivery nearby, stopped by just now, Snerdley went out there, got him, brought him in. We had to do it and get it done because time is tight here. So that’s what that was all about. He’s a UPS driver and we are on the route. And don’t worry. It was not a slight to FedEx because we deal with all of them as professionally and in a friendly manner as we can.